JazzSmart provide quality instrumental workshops for Saxophone, Flute, Clarinet, Big Band, Jazz, Pop and Contemporary Music , bringing well known highly experienced musicians and educators for fun filled courses throughout the year. Although our focus is on quality we also try and keep the price as affordable as possible to encourage budding musicians to join in and improve their playing and overall musicianship. JazzSmart courses are exceptional value for money, and include workshops on Jazz, Classical and Pop repertoire. JazzSmart’s music workshops have been running since 2008 and have repeatedly scored top marks by our course attendees, and we are constantly looking at ways to making the JazzSmart experience even better. Whether you’re a beginner, intermediate, advanced player or teacher, JazzSmart can offer something for you. 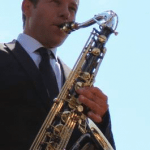 Founder of JazzSmart, James is a leading saxophonist and educator in the South of England. His original and ongoing idea is to bring together other passionate musicians along with world class educators to form a synergy of great music in a workshop setting. Due to the overwhelming success of early workshops, Andrew joined James to further grow and administrate JazzSmart. Fresh from completing a music degree, and with a background in IT, Andrew works with James to ensure JazzSmart continues to maintain a focus on high quality workshops. After such a great 2017 we are aiming in 2018 & 2019 to bring you the best music workshops we can, using the UK’s best saxophonists, educators and upcoming professional musicians. Kerry Long who is representing Vandoren, Yanagisawa & Trevor James so there will be an abundance of saxophones and accessories to try. Erik Claeys representing Selmer Paris for the Andy Scott Saxophone Ensemble workshop in February 2019. Yamaha saxophones will be joining us for the Pete Long Big Band Workshop in October 2019. D’Addario will be joining us for the Bob Reynolds Saxophone Masterclass, quality reeds and mouthpieces aplenty! When possible we have David Griffiths (Griff) in residence who will be giving free spot checks, and running a book in system to have your instrument tweaked, regulated and serviced while you learn! (please note: Griff will discuss with you your requirements and relevant charges for any undertaken work). Kryzstof Urbanski, Andy Scott, Mike Hall, Derek Nash, Dan Mar-Molinero, Simon Willescroft, James Rawlinson & James Stead. JazzSmart Workshops look forward to seeing you soon!